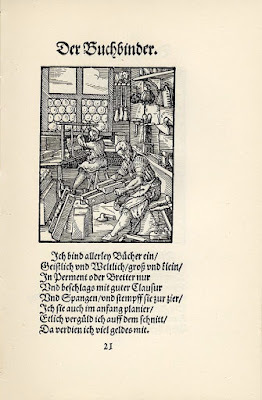 Ständebücher, or books describing social classes and trades were fairly common in 16th/17th century "Germany" providing valuable descriptions and insights, and in the case of trades, the tools and working environments of the craftsmen. The two most well known ones are Jost Amman's (1539 - 1591) Ständebuch, Eygentliche Beschreibung aller Stände auff Erden, Nürnberg, 1568, and Christoph Weigel's (1654 - 1725) Abbildung Der Gemein-Nützlichen Haupt-Stände Von denen Regenten Und ihren So in Friedens- als Kriegs-Zeiten zugeordneten Bedienten an, biß auf alle Künstler Und Handwercker, or Ständebuch, Regensburg, 1698. Amman's well-known image of the bookbinder is iconic within the bookbinding community. The text below the image is attributed to Hans Sachs (1494 - 1576). Amman was born in Zurich, Switzerland the son of an academic but settled in Nürnberg, Germany, completed over 1500 prints and died in poverty. Sachs was a Meistersänger, master poet who started off learned the shoemaker's trade before deciding to become a poet. Insel Verlag, Leipzig/Frankfurt, Germany published several editions of facsimiles of the woodcuts beginning in 1934. With which I earn much money. Da verdien ich viel geldes mit. 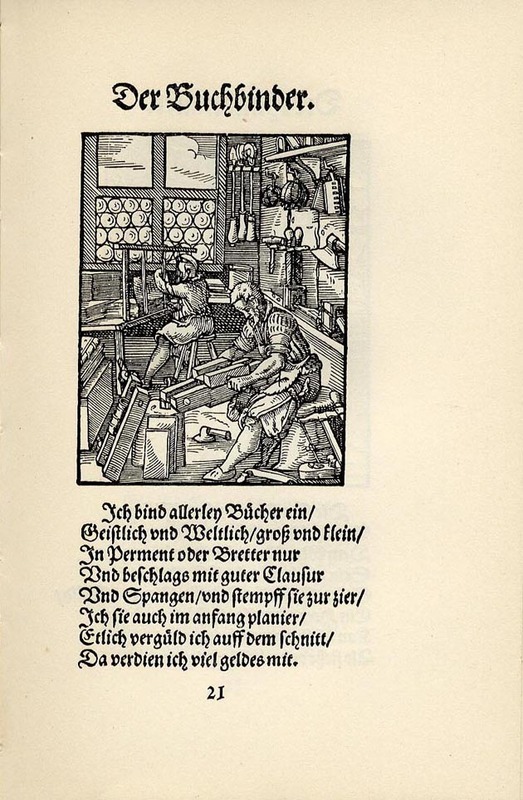 The woodcut shows a very well equipped bindery with books being sewn on a sewing frame, [the master?] ploughing the edges of a book with the press supported in his lap; books in laying presses, a paper beating hammer on the floor as well as a scraper and the saw resting against his stumpish stool. The walls show rolls with lines and patterns (based on apparent width), a drill, rasps, and axe for working wooden boards. In the same vein, were Weigels Abbildung Der Gemein-Nützlichen Haupt-Stände Von denen Regenten Und ihren So in Friedens- als Kriegs-Zeiten zugeordneten Bedienten an, biß auf alle Künstler Und Handwercker of 1698 described the trades in prose with illustrations of each, 4 pages in the case of the bookbinder. While Weigel, a leading engraver and publisher of the time, is credited with many of the plates in this work, he did not create all the plates, especially for trades would not have know much about (such as nautical ones). 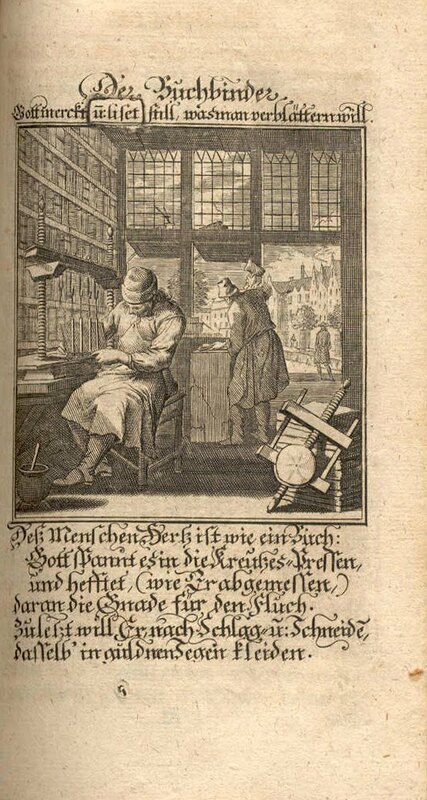 The others were purchased from Jan Luyken of Amsterdam who had published Het Menselyk Bedryfa, a similar book of trades in 1694, and also depicted the bookbinder. [Source: Bauer, Michael: Christoph Weigel (1654-1725), Kupferstecher in Augsburg und Nürnberg. Sonderdruck. Frankfurt a.M. 1983] Weigel's Ständebuch is online at the State Library of Saxony in Dresden, with no mention being made in the catalog of the Luyken's contributions. The bookbinder begins on page 414 (actual page count starting with pastedown), with the plate following paginated page 256.Thank you to Jeff Peachey for alerting me to the work of Luykens and to other sources. Looking at the identical image of the bookbinder (from Etwas für Alle) below one can see a very typically Northern European (Dutch) architecture indicating that this plate most likely originated from Luyken as well. the grace for the original sin. clothe the same in golden blessings. daran die Gnade für den Fluch. While the bookbinder at left is sewing a book on four cords (gluepot at his feet), his colleague is beating the pages flat as was habit at the time. Jeff Peachey discusses the practice and beating hammers on his blog in two postings (first | second). A plough with circular blade for trimming book edges rests against a stack of books on the floor. 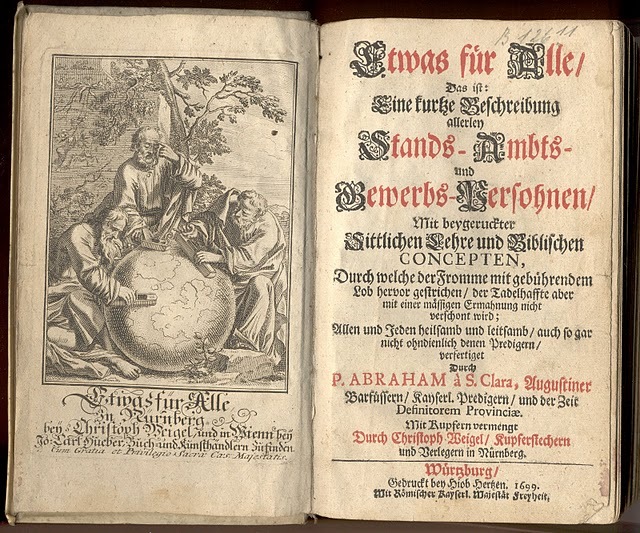 Abraham à Sancta Clara's Etwas für alle, Würzburg, 1699, i.e.. Something for Everyone, That is a short description of persons of various classes, offices, and trades... also included a catechism, something that was not uncommon during that time. This used the same engravings as Weigel's Ständebuch. Sancta Clara, an Augustinian monk, was born as Johann Ulrich Megerle (1644-1709) at Kreenheinstetten, near Messkirch in Baden, Germany and was appointed imperial court preacher at Vienna in 1669. So I will also, where much praise is due the bookbinders, because truthfully: useful, highly useful is the hand of the bookbinder, because a book without a binding is nothing more than a mirror without a frame, a house without a roof, a garden without a fence, a town without a wall, a steed without a saddle. The binding that which makes it possible to read a book comfortably and gainfully. So ist es mir auch erlaubt, wo einiges Lob den Buchbindern zu geben, denn in allerlei Wahrheit: nützlich, übernützlich is die Hand des Buchbinders, da ein Buch ohne Bund nichts anderes ist als ein Spiegel ohne Rahmen, ein Haus ohne Dach, ein Garten ohne Zaun, eine Stadt ohne Mauer, ein Roß ohne Sattel. Der Bund macht erst, daß man ein Buch bequem und mit Nutzen lesen kann. While many sew their books together so loosely that the leaves soon fall out just as easily as the leaves are blown off of a tree in the fall. Others due partially to inexperience and laggardness that cause the signatures to misalign and as a result damage and bring shame to the book. Finally there are the many, yes, even most bookbinders that don't just know how to make a gilt edge, but also know how to live a virtuous life. Etliche zwar hefften die Bücher zusammen so liederlich, daß die Blätter so bald abfallen als die Blätter von einem Baum, denen der harte Herbstlufft gleich den Rest gibt. Einige seynd wohl auch theils aus Unerfahrenheit, theils aus Saumseligkeit, Welche die Bögen versetzen und folgsam dem gantzen Buch ein Schad and Schand zufügen. 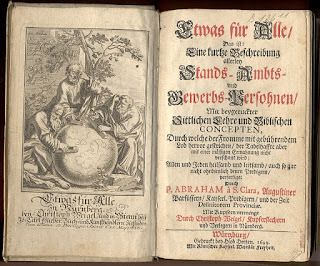 Im übrigen seynd ohnegezweifelt sehr viel, ja die meisten Buchbinder, die nicht alleyn einen guldenen Schnitt zu machen wissen, sondern auch einen guldenen Wandel führen. Because the exterior binding and cover, if they are well-made and preserved, protect the book from damage over time and allow the pages to be turned and opened at will quickly and without loss of time, whenever one wishes to read or note something; because of this the praiseworthy trade of the bookbinder is a necessary as useful. Da die Bücher der aüßerliche Einband und die Decke, wenn sie wohlgemacht und reinlich gehalten werden, von beeden ziemlich lang bewahret und die Blätter nach Belieben ohne vielen Zeitverlust flüchtig herumbgeworfen, das jenige leichtlich aufzuschlagen vergönnen, was man zu suchen und etwan zu lesen oder auszuzeichnen beliebet; solcher Gestalt is das löbliche Handwerk der Buchbinder so nötig als nützlich. All these sentiments about bookbinding and bookbinders note the importance of the trade for the preservation of the texts, access to them, and as the climax of a holistic work. With the explosion in the printing of texts during the Reformation, the role of the bookbinder in their dissemination was clear to all.